Walt Disney's love of animals and nature leant itself to many films during his career. Outside of animal characters in animated shorts and films, he started a series of live action nature documentaries with a series called True-Life Adventures. These films lead to story-based animal films. While Charlie the Lonesome Cougar was greenlit by Walt, filming didn't begin until after his death. Therefore, this is the first film made by Disney without his involvement. The project was written and directed by Winston Hibler, who worked on some of Disney's most classic animated films as well as his nature documentaries. Rex Allen narrates his last Disney film, after narrating other story-based animal films like The Incredible Journey and The Legend of Lobo. The task of filming was outsourced to Cangary Limited. The human cast is entirely made up of unknowns, most of whom were natives of Washington near the Columbia River Gorge, where the film was shot on location. Jack Spiers and Franklyn Marks wrote the main credit song "Talkin' About Charlie." The film begins with a fun animated credit sequence to an upbeat song written about Charlie. After the credits we are introduced to orphan baby Charlie, who is adopted by a man named Jess who is a logger. When Charlie grows big, he begins to cause a lot of mischief and trouble for Jess. He creates a log jam in the river that they use to transport logs and causes Jess' boat to catch fire. Charlie gets himself in a pinch after stealing from a farm, causing the farmer and his dogs to chase after him with guns. He then gets the whole town mad at him, and a chase ensues between the loggers he used to be friends with, resulting in Charlie getting trapped in an elevator shaft. Jess steps in at the last second and is able to calm Charlie down. In the end, Jess takes Charlie to a protected reserve where he will be free. Charlie the Lonesome Cougar was released on October 18th, 1967. It was part of a double-bill with The Jungle Book, which was released on the same day. The Jungle Book earned $13 million in its original release and was a huge hit, but it is hard to determine what percentage of the audience stayed for Charlie. The studio didn't have enough faith in it to release it separately and it feels more like the type of film that would have been made for TV by Disney in this era rather than theatrically released. It is not surprising that it made its TV debut in 1969. It's first home video release was in 1985. Compared to Disney's other live action animal films from this era, Charlie is able to hold its own. But modern audiences have come to expect animals to talk in this type of film and I imagine most modern kids would have a hard time sitting through the whole film. I think the main audience for this film nowadays are adults who were delighted by the story as a child. The narrative gets dry several times where it is easy to lose the audience, but there are a few moments worth waiting for. The highlight of the film is a scene where Charlie rides a log down a log flume. And the early scenes of young Charlie bonding with Jess are truly adorable. 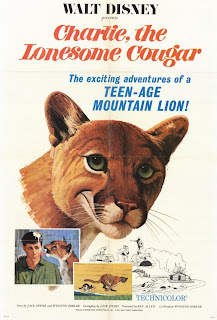 Charlie the Lonesome Cougar is currently available on DVD, where it is presented in fullscreen. The theatrical release would have most likely been widescreen, but the fullscreen presentation feels correctly framed. The opening credits are even set in a little so overscan doesn't cut them off and the ratio of that image is 1.33:1. The film does have some visual flaws, with dust and white specs not fully removed during the restoration. There aren't any bonus features. It is also available on iTunes, where it can be purchased in HD. What happened to Charlie the cougar in the film..any info..? Charlie found a mate, saw Jess once in awhile and lived his life as a cougar..